I want to wish you all a safe and Happy Christmas. This, my first year of blogging , has been a wonderful experience of meeting so many amazing people that I look for to continued friendships and learning new skills along the way. Whatever you are doing over the festive season I hope you enjoy the spirit of the season. I am working all over the Christmas season so the celebrations at home will be quiet. At least I work in the Maternity unit so it is a happy place to be as families celebrate the birth of a new little one. Two days ago I decided that my brother in law did not have a decent Christmas stocking so I would make him one and this morning I actually finished it so am very pleased. It is a pattern from a Handmade magazine a couple of years ago and I have made a few now adding a machine embroidered name on them. This is thefirsttime I have worked it out first time with no unpicking so am rapt. Hope he likes it. The next one I make will be for myself-my sister and I were just laughing as my stocking this year is a Christmas paper gift bag. A couple of years ago my nephew bought a very cheap ($1 or thereabouts) stocking from a bargain shop and hand embroidered my name on it. Bit of a joke really but it is a treasure and I love it -where is it at the moment? ?I don't know and haven't got time to look unfortunately. 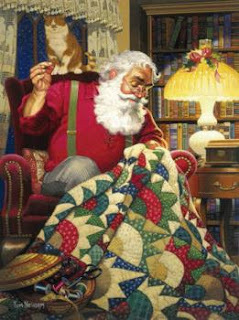 When we wake up tomorrow the man in the red suit will have been and left us goodies to open-that is if you have been good this year of course!! It also means we get to open the hand made gift of our Advent Swap-who has cheated already? This swap has been alot of fun and I hope we do it all again next year. Here are some more of my lovely gifts I received from Sigrid. Your brother should love that stocking. If not, I'm happy to unpick his name and keep it for myself! It's great! Blessings, Marl, for a beautiful Christmas spent with family. What a lovely stocking! I made all my kids one years ago... it's about time I made new ones.. ahhh... maybe for next year now! MERRY CHRISTMAS ... I hope you have a lovely festive season. MUCH LOVE. Hope you have a wonderful Xmas.